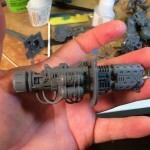 Imperial Knight Conversion: Pt. 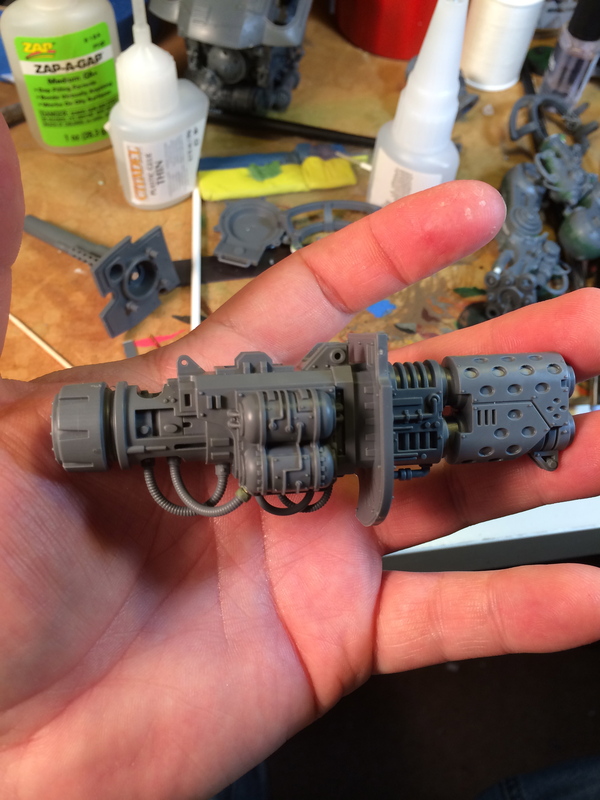 6 — Magnetized weapons. 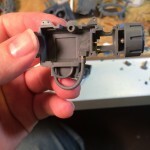 Buckle in for a very pic heavy tutorial on getting the 100% correct representation of both weapons in the new Imperial Knight kit. Of course, the amount of time this took might make an eBay purchase for a second arm seem worth it. I’ve used three different sizes of magnets on this, plus some magnetic strips (they come with a sticky back, purchased at Wal-Mart for very cheap, and are not terribly strong). Unfortunately, I don’t know the actual size of the magnets as they’ve been collected over time and as gifts. 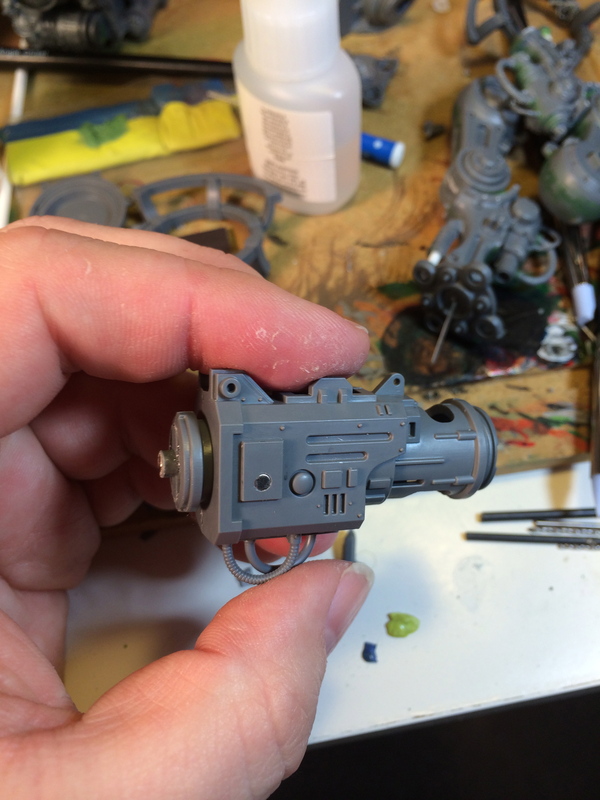 Let’s start with a look around where the magnets have been placed in the main gun body. 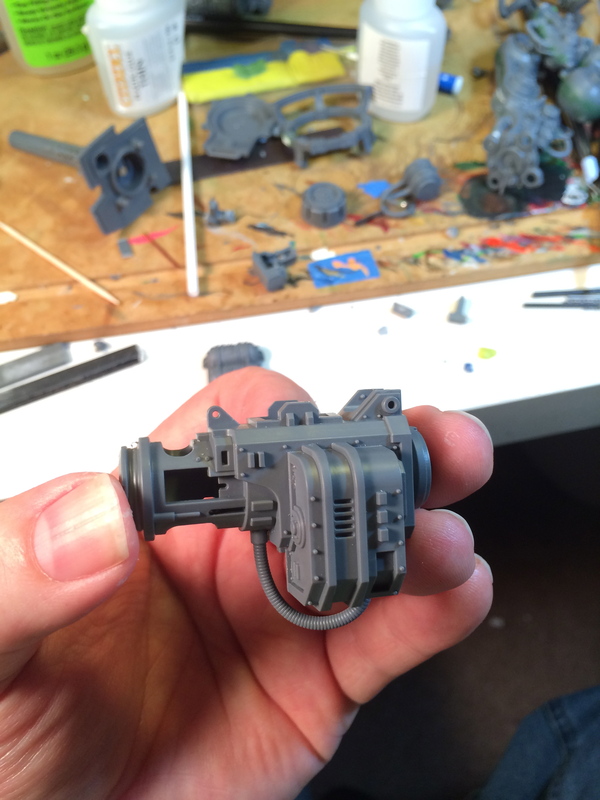 First up, take a look at this weird black thing where the ammo bits attach. That’s a piece of low-strength magnet strip that I got at, of all places, Wal-Mart. 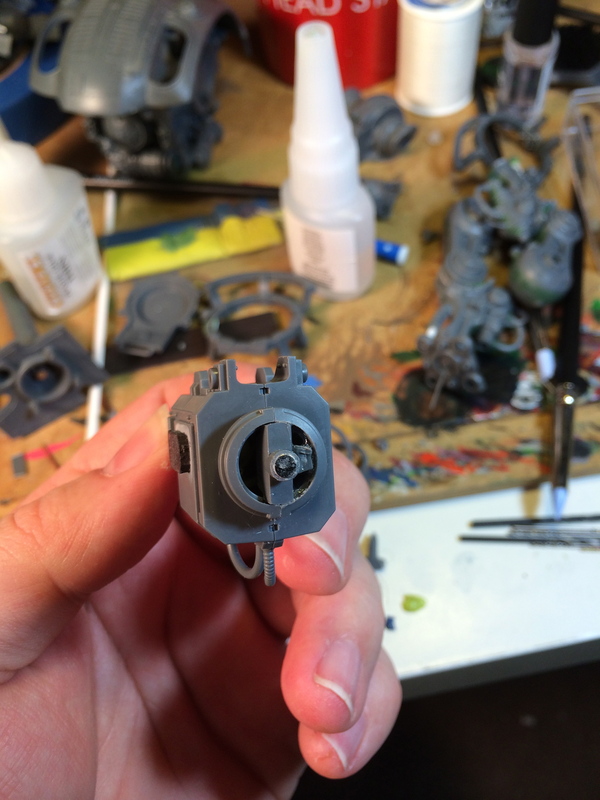 It’s basically magnetized sheet plastic. It’s super easy to cut to shape and it’s dirt cheap. 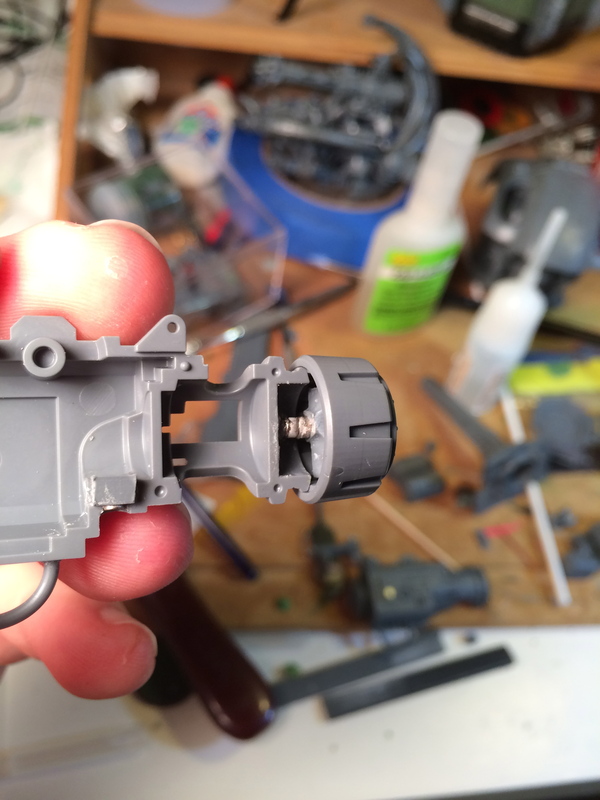 I could have used little rare earth magnets here, but honestly the pieces stay on with just the tension of the plastic because the bits are so well cut. I love this kit. 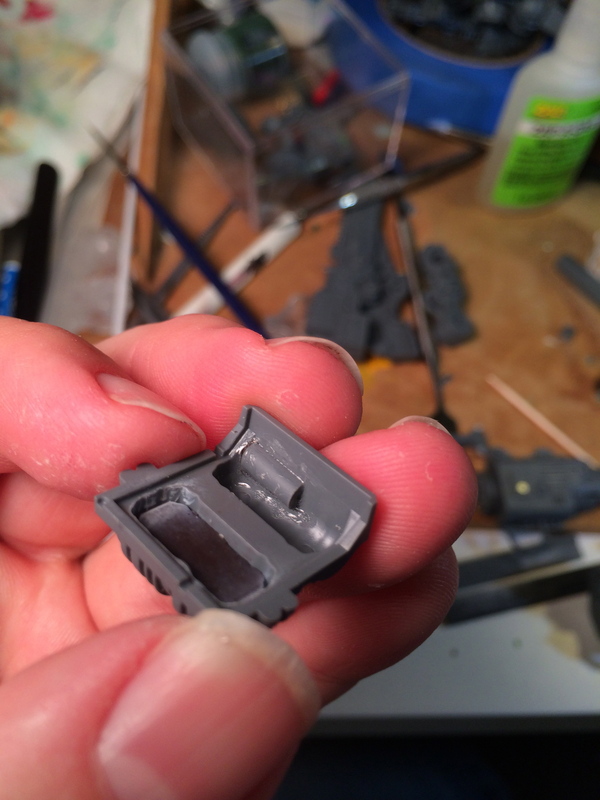 Anyway, this is just a base that’s been cut to fit so it works for both of the ammo bits. The white around it is ghosting from superglue fumes. 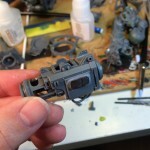 Here’s the front, where the main weapon barrels will attach. 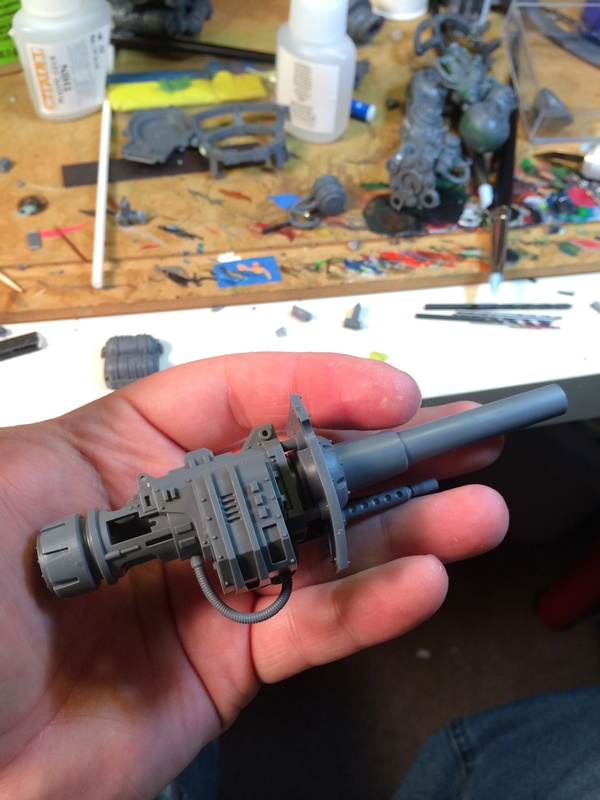 I’ve built this out of bit of sprue that has the cylinder of extra plastic sticking up. 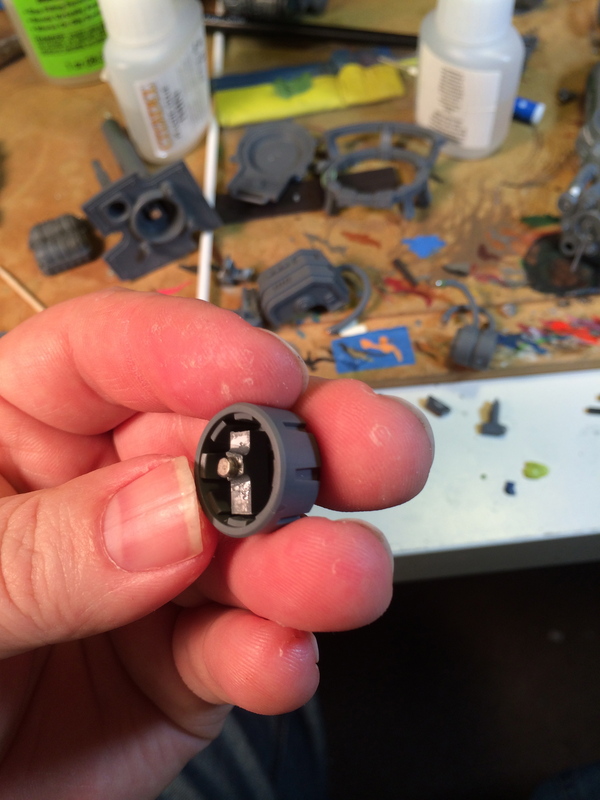 It’s nice to be able to sink the magnet into something so the superglue has more to attach to, and prevent it popping out. 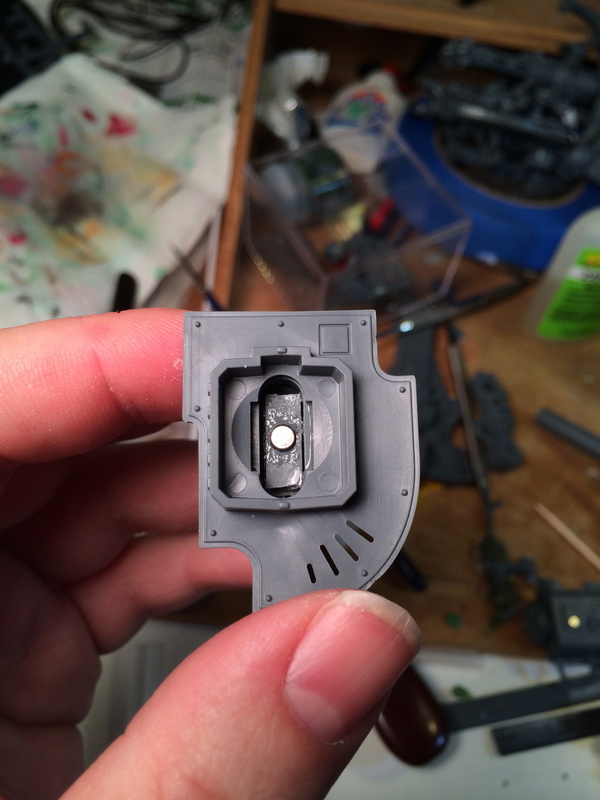 You can also see a bit of sprue that I’ve jammed on one side just to give the plastic center sprue to glue to. 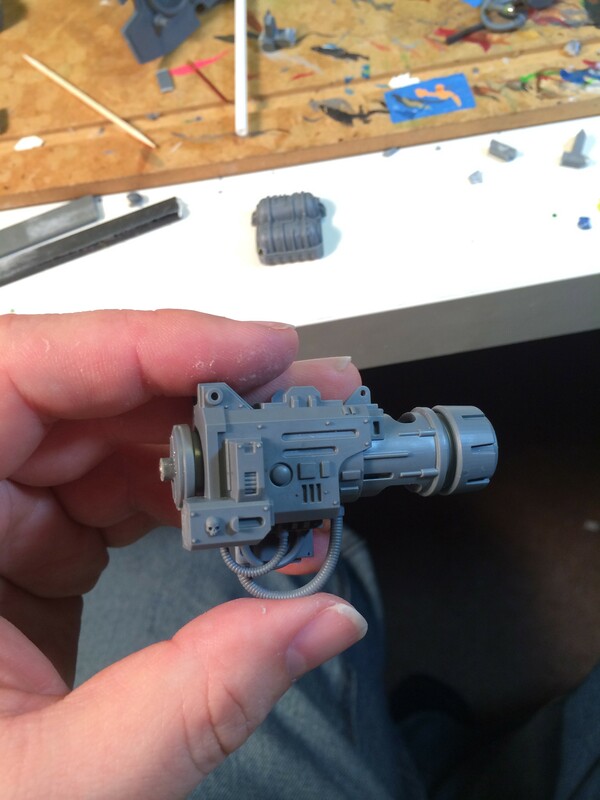 This is only glued on ONE SIDE of the main gun body. 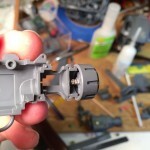 The part touching the left is not glued, as you need to be able to take the main body of the weapon apart. Now flip it to the back. And here’s the back. 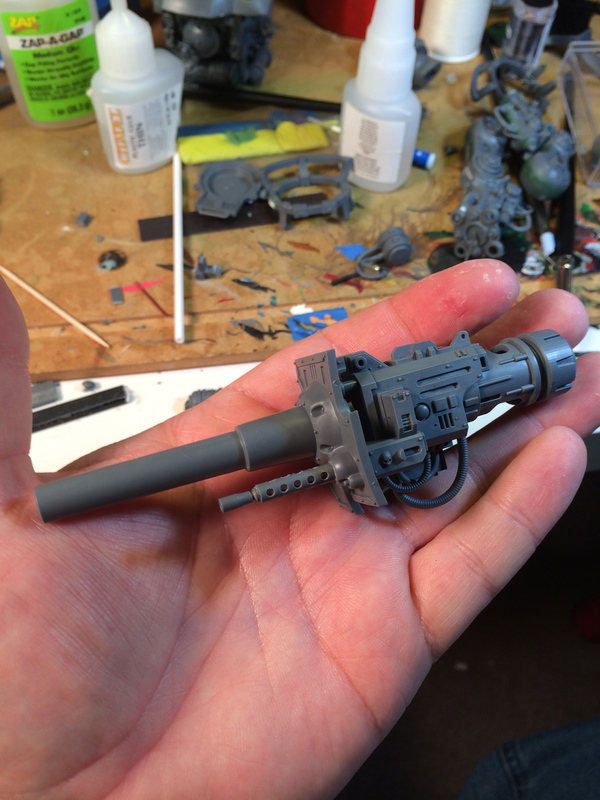 There’s a cap that fits over this (the one with the AdMech cog) and this is really important. 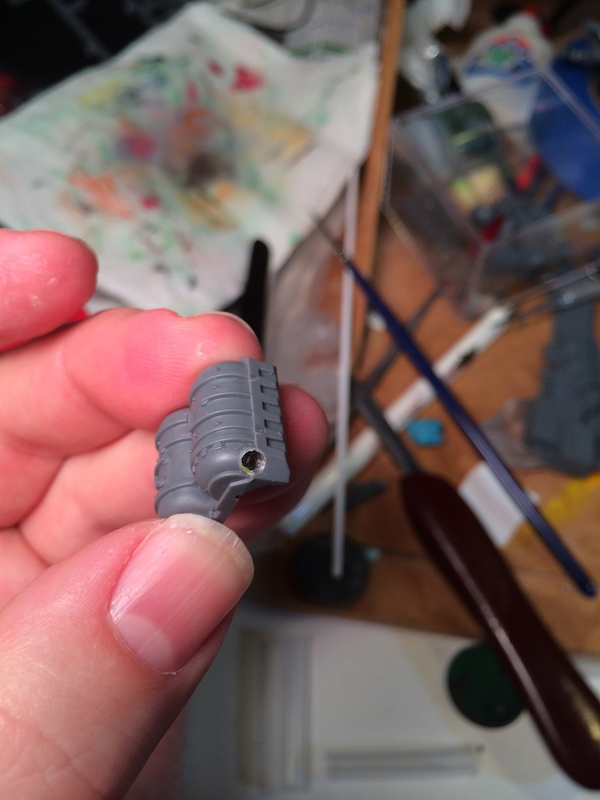 The only thing holding the two halves of the main gun body together are this cap, and the barrels on the front. These magnets have to be pretty strong to give you a sturdy base. 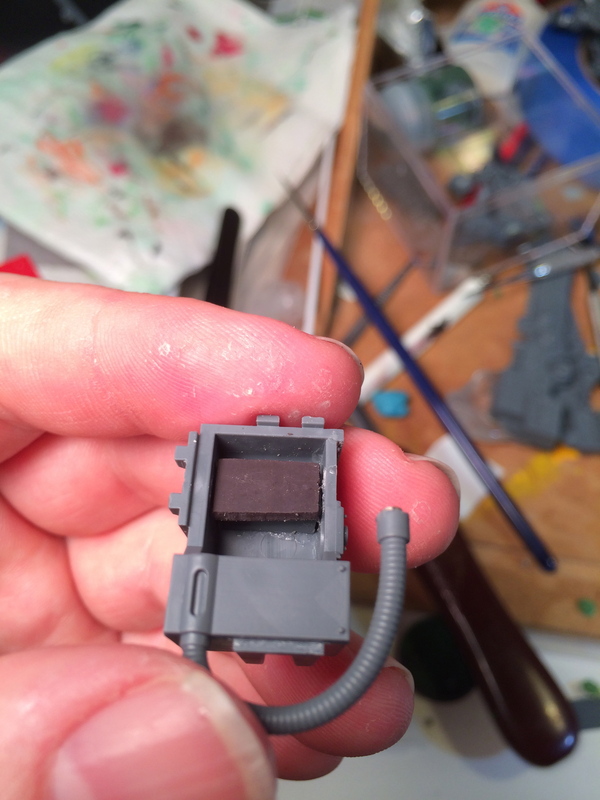 I’ll show another angle of this in a little while, as there’s a little plastic spacer under it as well. 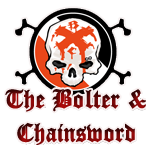 Now that we’ve taken a tour around it, let’s take a look at the bits. Here’s the back cap I was just talking about. 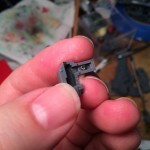 You can see I’ve simply glued a piece of T-shaped sprue down here to give it the right length. Here you can see the two halves joined. They are literally touching. 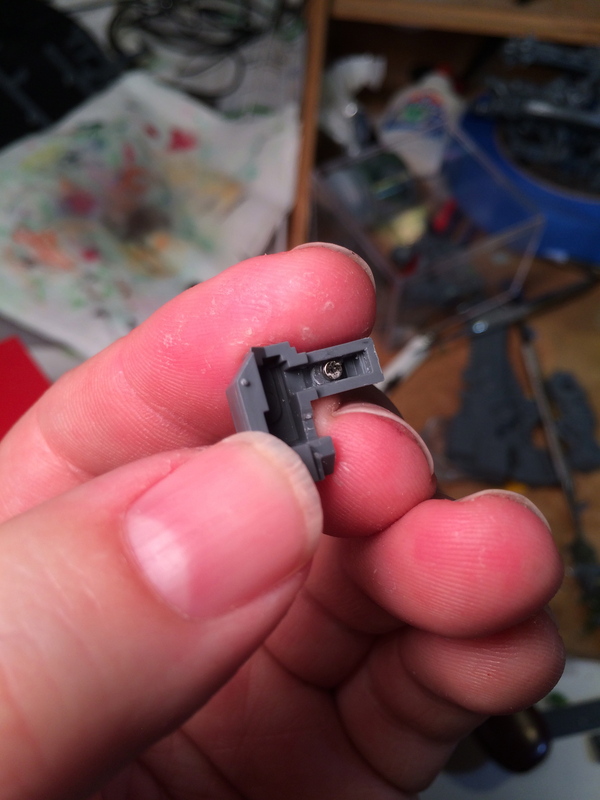 Note the tiny bit of sprue spacer under the one attached to the main gun body. I just kept filing it down little by little til it allowed them to just touch and glued it in place. 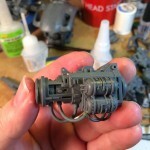 Also note the bit of sprue by my finger, with another magnet sunk into it. 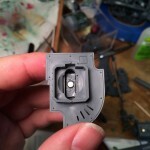 This is where the tubes for the ammo bits will snap into place. Here’s another angle of the spacer for the back cap and the magnet on the bottom. 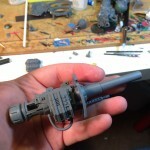 Okay, let’s look at putting together the melta bits, piece by piece. 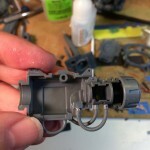 First things first, you have to open the body up and pop the fuel manifold inside it. You can see now that one of the hoses has a magnet in it, which snaps quite nicely in place with the one in bottom of the gun. This will not be visible in the final build as it’s recessed. This is the back of the melta fuel cans. You can see more of the black magnet strip. 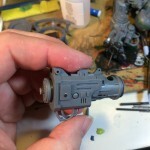 Behind this are a couple pieces of sprue glued together and trimmed down so this fits nice and flush with the one on the body. 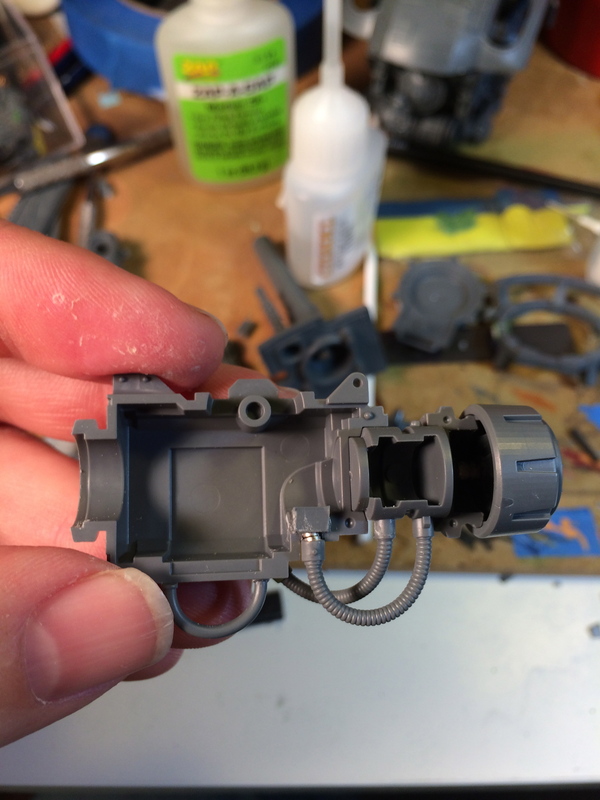 Also, note the bits of sprue that are glued on the bottom. Those are staging the housing for a small magnet on the other side to nest in there. Flip that bit over and this is what you see. The other side of the cans. Now you can see the little magnet in there. This bit was a little fiddly, and I’ll have to do a spot of green stuff around it as some detail was lost in the drilling. 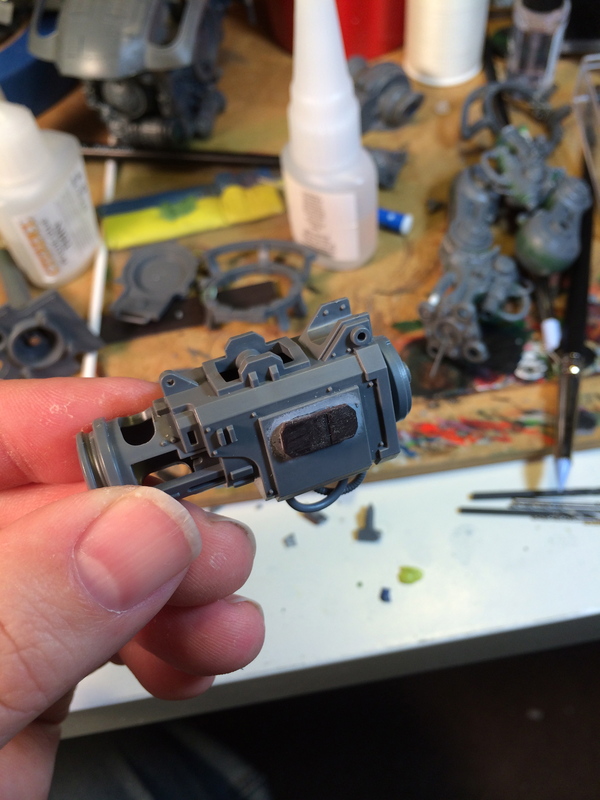 Now simply pop fuel cans on and attach the end of the tube, which also has a magnet on it, into place. I had to rebuild half the tip of this hose out of GS again, as the plastic was split 50/50 with the can bit and I had to cut away the other half to drill out the magnet hole. You’ll see what I mean when you look at the plastic part. Now here comes the business end. This is the inside of the melta barrels. 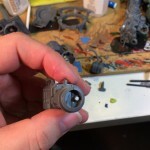 As you can see, I used yet more sprue bits and dropped them into the barrels themselves to build up the space for the magnet to attach to. There are three spans in there, and then I drilled just a shallow hole and mounted the magnet there. 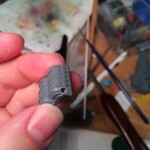 The back of the sprue bits are resting on a cross beam between the barrels, so it’s quite sturdy. Pop the back cap on, and the barrel, and you’re done. There are magnets on the tips of both hoses, the cap and barrel, and the strips on the body and the cans. It’s sturdy as heck. I can shake it around and it stays together. 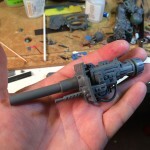 Now for the battle cannon. Back of the ammo can. 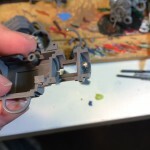 Once again, a strip of the black magnet, supported by sprue bits behind for spacing, and superglued in place plus a small magnet sunk into the tip of the tube. Attached to the body so you can see how the magnets in the tubes match up, this time from the front of the gun istead of the back. And from the front. Tight fit. 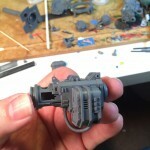 Notice how the back of the gun is empty, to allow for the recoil mechanism and breach to operate (in my imagination). 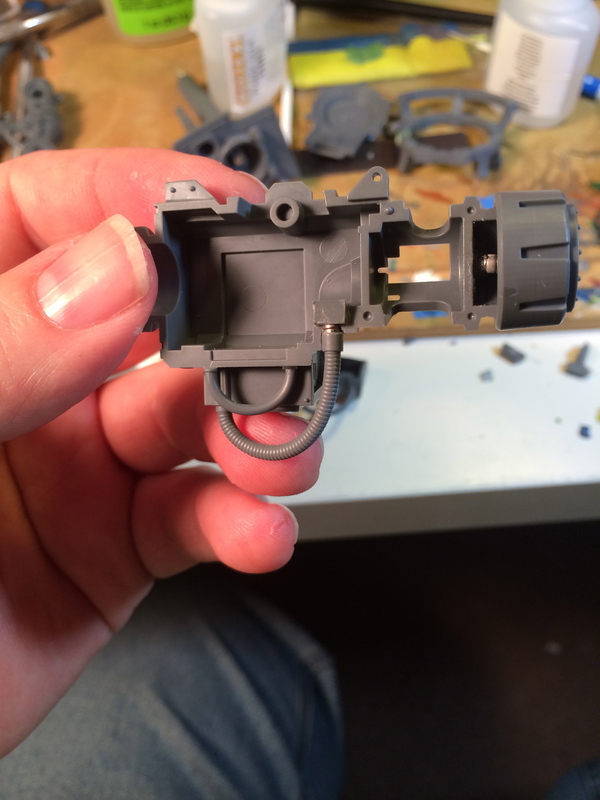 Again, this is the step I’ve seen people are skipping but I think it makes the cannon very distinctive when fully assembled. If I didn’t care about this hollow chamber, this tutorial wouldn’t exist because the rest of the job would be SO much easier. Turn it over and get your heavy stubber bit ready. 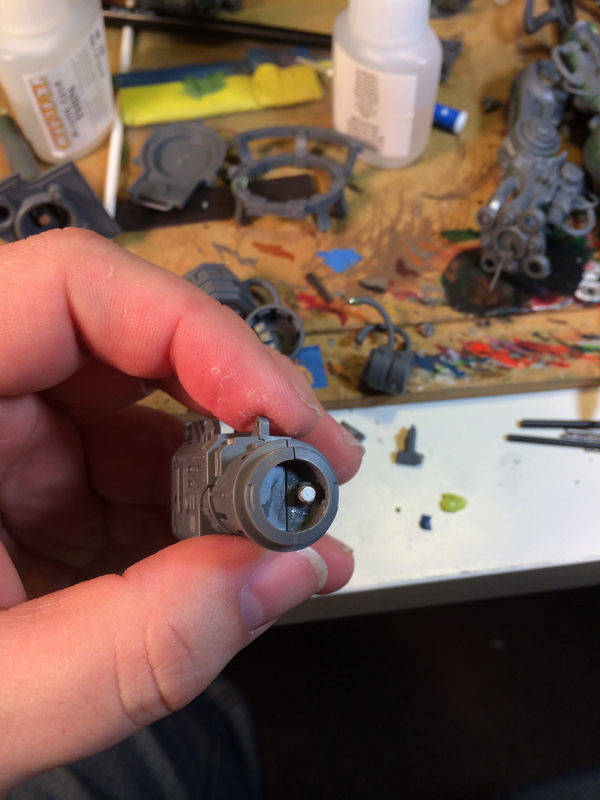 This one has a very small magnet, and another VERY small spacer made out of scrap sprue that was filed into shape and glued down. I used a pencil to mark the right spot on the gun body so these would match up. 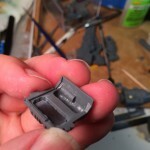 NOTE: I thought at first that I’d be able to simply glue the back of the gun to the front plate of the cannon. It looks like it fits and would be super easy if it worked. YOU CANNOT DO THIS and keep it intact when you take the barrel and plate off. 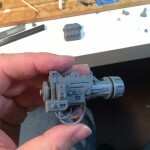 There is molding on this stubber bit that fits right around detailing on the gun body, so you can’t slip the half of the gun straight back if this is glued in place. If you try to twist it sideways, it puts too much sideways stress on the back of the heavy stubber. I had it glued in place at first but I noticed the problem before the glue dried. Glad I didn’t have to cut it. Now pop it on the gun body. 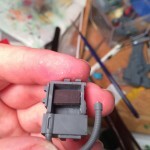 It fits around some molding so it slides into the correct position and it’s held in place with the magnet. Just need the barrel now. 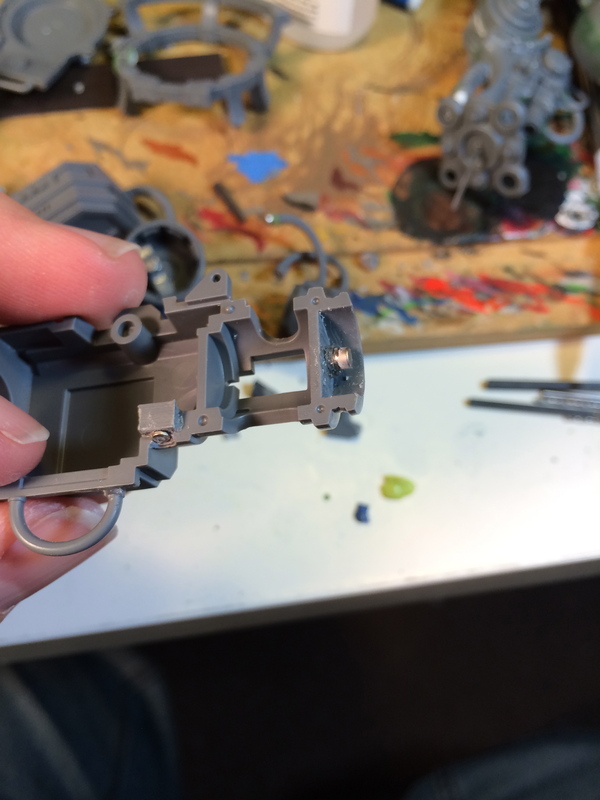 Here’s the inside of the cannon, showing the magnet. 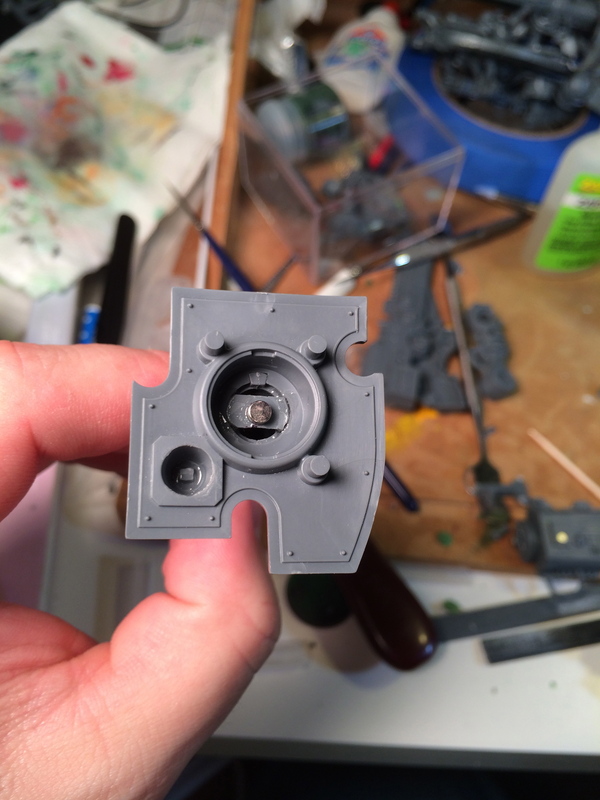 I had to cut this little sprue bit down just right. It’s got a lip on it, so it sits down into the barrel about halfway but is seated on the rim there. This allowed the glue more surface area and added stability. Slap the magnet on there (just glued right to the surface this time) and she’s ready to rock. Pop that on the front. And that’s it! Notice the empty rear chamber. The two guns really do look distinctive. So, that’s that. A lot of work, but I think it’s worth it. 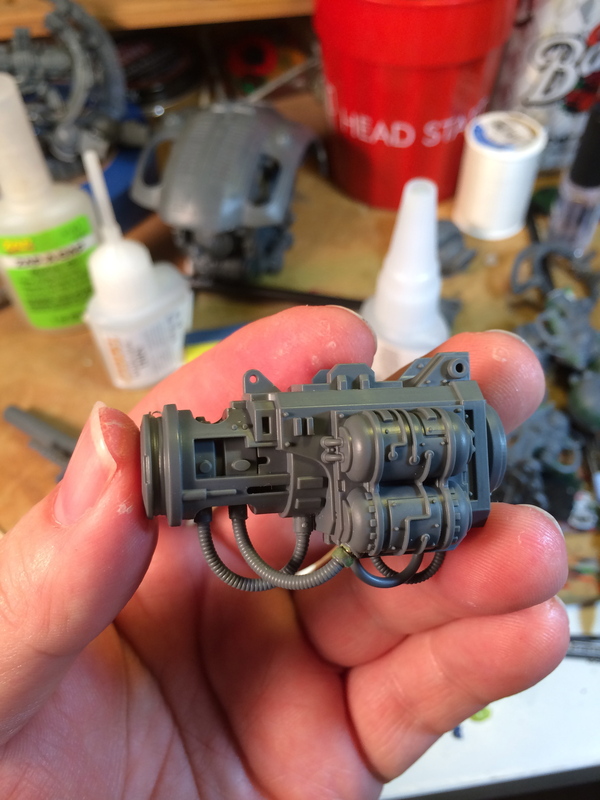 The thing is all sprue bits and too much glue, but better safe than sorry. 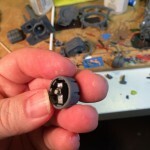 As always when working with magnets, be careful to get the polarity right BEFORE you glue it. Also, since most of your tools are probably metal, keep some toothpicks (cocktail sticks) or plastic tweezers around to fudge with the position of magnets while the glue sets. If they flip up and attach to your tweezers, take the time to check the polarity again. It’s not a fun mistake to discover. Also, there were many times where I could have fudged the spacing. Magnets this strong work pretty well even when they’re not actually touching, but as the main gun body wasn’t glued or even magnetized, the ones on the back cap and front of the gun had to be as strong as I could make them. 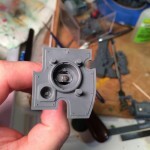 I spent a lot of time cutting, filing and glueing the sprue spacers to get them just right. 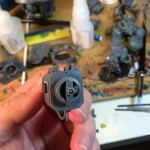 I also spent quite a bit of time with the drill to get the magnets sunken in the way I like. I usually like to leave them sticking out just a tiny bit, but most people like them flush. 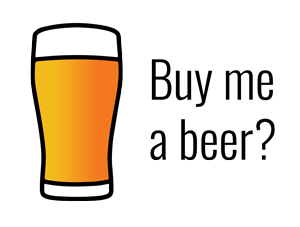 I’m sure if you’re reading this you have your own preference. As long as they’re invisible once it’s painted, you’re fine.